Spring is in the air and with it comes the return of EAST PACK, the Northeast’s Premiere Packaging Marketplace!  Wexler Packaging Products, Inc. will be exhibiting at the show, which will take place at the Jacob K. Javitz Convention Center in New York, NY, June 9 -11, 2015. Exhibiting in Booth #3003, Wexler Packaging Products will showcase a variety of packaging and bundling solutions. Featured equipment on display will include the ATS US-2000 CL2-TTP-R automatic banding system with thermal transfer printer. An excellent solution for the new requirements set forth in the Drug Quality & Security Act, this efficient Ultra-Sonic machine combines banding and on-demand printing in one simple step. Whether it be barcodes, lot numbers, expiration dates or serialization, the versatility of the ATS US-2000 CL2-TTP-R allows you to bundle and print whatever you need in 2’s, 3’s, or 4’s. If your packaging needs include labeling, booth attendees will have the opportunity to see Ravenwood’s Nobac 500 Linerless Labeling System (sleever) in action. Ideal for retailers and packers, this versatile system is specifically designed for maximum flexibility and rapid changeover. The Nobac 500 sleeving application is available in six formats (top, top & side, top & two sides, C-wrap, full wrap and removable sleeve), and in both fixed and variable weight modes. A thermal transfer overprinter can also be fitted to this system for printing at the point of application. 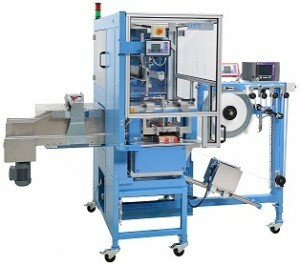 Standard floor model banding units will also be on display along with additional packaging and bundling solutions. As always, Wexler will be offering an exclusive discount for any machines purchased during EAST PACK. 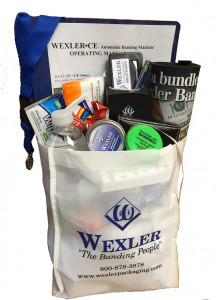 In addition, booth attendees will also receive a signature Wexler Tradeshow Survival Kit. These one-of-a-kind custom bags are filled with everything expo attendees could possibly need and more. They are Wexler’s way of making sure attendees are prepared as well as our way of saying “thanks” for visiting us during the show. Join our Team at EAST PACK 2015 and see a year’s worth of packaging innovation in just days. For more information, please visit www.eastpackshow.com.